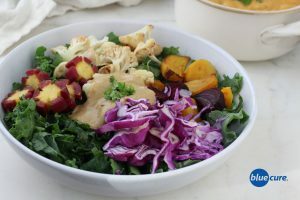 Orange miso salad dressing is sweet and tangy, yet refreshing and fairly light. Serve it over vegetables for a side salad to your main meal, or add cooked quinoa, beans, and cooked potatoes. Preheat the oven to 400F. Wash and chop the veggies. Roast the beets, cauliflower, and carrots for 20-30 minutes. The beets may need up to 40 minutes. Combine all the dressing ingredients in a high speed blender. Blend until smooth. In a bowl, combine the roasted veggies, greens, and the dressing. Add in cooked quinoa and beans to make a meal. Enjoy!